(Newser) – It's looking more and more likely that US farmers will be getting back into the hemp-growing business. The latest hopeful sign for advocates came when the House passed an amendment that would make it legal for universities to grow hemp for research purposes—an important step if farmers ever hope to make it a successful agricultural crop, reports the Wonkblog at the Washington Post. The bad news is that the amendment was part of the larger farm bill, which unexpectedly failed. 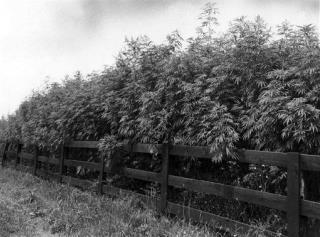 Make industrial Hemp Legal? I can tell you that Industrial hemp has a hold in Mid Missouri (Lexington) and has been there since the Wars, It's been there ever since I can remember and still there today! The government used Hemp in a lot of things, Rope being no.1, you name it..canvas, also commercial products... So, all you people are getting screwed again by your Nazi Government! DEA has nothing to do with making fiber clothes, ropes, rugs, and such.. The cotton growers might get a bit upset, and lets not forget about our petrolium clothes makers...the product of rayon, nylon and such! Just legalize it on a trial basis for 5 years. By then if it is ruining the USA, make it illegal again.